For my birthday this year my boyfriend gave me a days gliding course at the London Gliding Club. I was both touched that he’d got me such a cool non-boring present and scared stupid that I’d soon have to ascend into the skies in a craft with no engine, kept aloft purely by naturally occurring thermals under some very thin wings. I have a love/hate relationship with things that push me out of my comfort zone and I do stuff that scares me a lot. I get a ridiculous idea in my head then throw down the gauntlet for myself with a flourish and a big “haaahaaaa!”, daring myself to go ahead and pick it up. Predictably once I embark on these tasks I wonder why on earth I continue to make myself do these things and why I insist on being such an eternal dickhead all the time, but I guess it’s the very fact that they are not easy that makes these experiences far more powerful for me. I might not like it at the time but I’m always very glad I’ve done it afterwards, and anyway no good story ever started with “I was sitting at home on my sofa watching telly…” now did it? 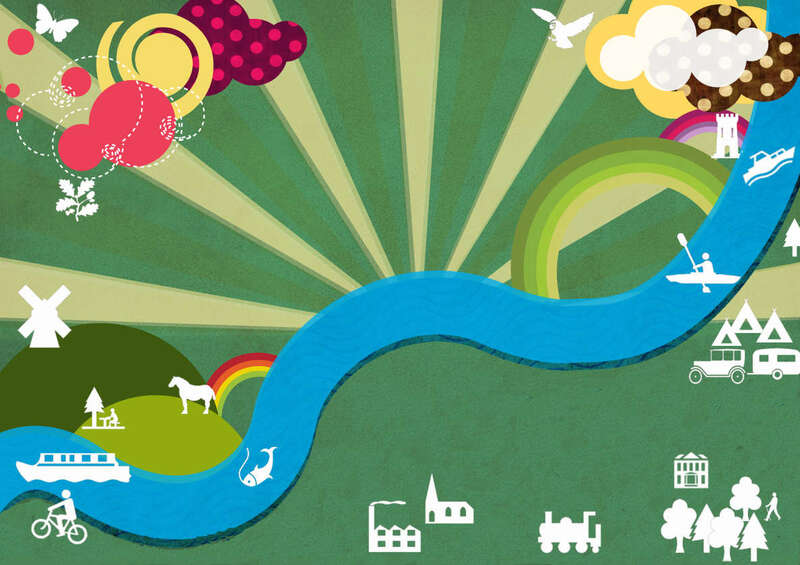 And so it was that we left the comfort of our south London flat in the early hours of a bright Sunday morning in search of the wilderness they call “Dunstable Downs”, near Luton. I was sporting sweaty palms and a stomach full of butterflies and my boyfriend a pile of text books to revise for an accountancy exam the next day. 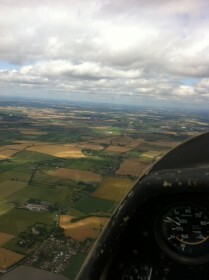 When I say I had sweaty palms you must understand that I was absolutely cacking myself, because I absolutely HATE flying. It’s got worse the older I get and no matter how many facts people throw at me like I’m more likely to get killed being stampeded by a herd of mules in the local boozer than I am in an aircraft, I still can’t get my head around hurtling through the air at 30,000 feet doing 500 miles an hour in little more than a big tin can. It’s for this reason that I used to take a lethal Molotov cocktail of Valium, red wine, white wine, whisky, coffee and as many varieties of danish pastry as it was possible to consume at the airport before every flight. It worked wonders for my anxiety as I generally passed out while putting my hand baggage in the overhead locker and fellow passengers or air hostesses would kindly buckle my seat belt for me and cover my worryingly inert body with a blanket before take off. However this strategy does have it’s downsides; I tended to wake up just as I was about to vomit, making the inevitable hurdling of passengers to get to the toilet in time nigh on impossible and I’d face a stinking hangover just hours after my cocktail of death had been consumed. After a while I also realised I was simply masking my fear and not facing it head on like you’re supposed to. Nowadays I “feel the fear and do it anyway” so instead of knocking myself completely unconscious I sit rigid in my seat, eyes wide, with white knuckles gripping my arm rests, repeatedly opening and closing the little in-built ashtrays, making me wonder how bloody old this aircraft really is and working myself further into a state of hideous distress. It’s not great fun for me or anyone around me, but at least I’m minimising the risk of turning into a drug addict or killing myself by overdosing. To distract myself from my impending flight in a glider I tried to spot brown tourist signs on the way to the gliding club and sat poised ready to take a photo at every junction within 10 miles of our destination. I’m sorry to say The London Gliding Club doesn’t have any brown signs, however this type of destination is exactly the kind of place I like to herald on my blog, packed full of people with a niche interest doing their thing and sharing it with the world, so they deserve a mention anyway quite frankly. After signing a disclaimer saying I wouldn’t sue if I got maimed/paralysed/severely burned in a hideous gliding accident I was given some training. 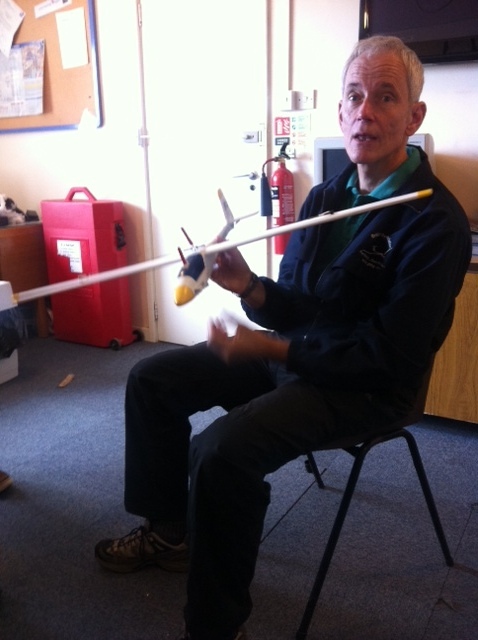 This mainly involved me being scared even more stupid by my instructor (pictured here with a model glider that encouragingly broke halfway through the demonstration). He explained that gliders don’t need an engine, or any other sort of power as they fly using forces of nature, working with lift and drag and “taking advantage of meteorological phenomenon” such as thermals that occur when the ground warms up, making hot air rise into invisible great plumes in the sky which a glider can sit and circle in, actually propelling them upwards to gain height. These phenomenon would apparently not only allow me to fly around in the sky for a while on a “pleasure flight” but also powered this man all the way to North Yorkshire and back in a day a few weeks ago! Unbelievable but true people. 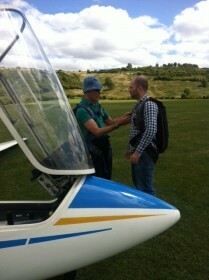 Here’s me adjusting my parachute while getting some emergency advice (“if something goes wrong just unlock the canopy, push the canopy off the craft, unstrap yourself and jump out into the big blue”). I wasn’t that happy about all this that was for sure. As the little prop plane began its take off, hopping along on the grass in front of us I braced myself as we were tugged along behind. It was all a bit of blur being towed into the sky on a rope and being released with a jolt to go it alone, the thing I do remember though is beginning to feel violently ill. A combination of fear and severe turbulence had begun to brew inside me and it wanted out, expressing itself through the medium of chunder all over the flight controls apparently. 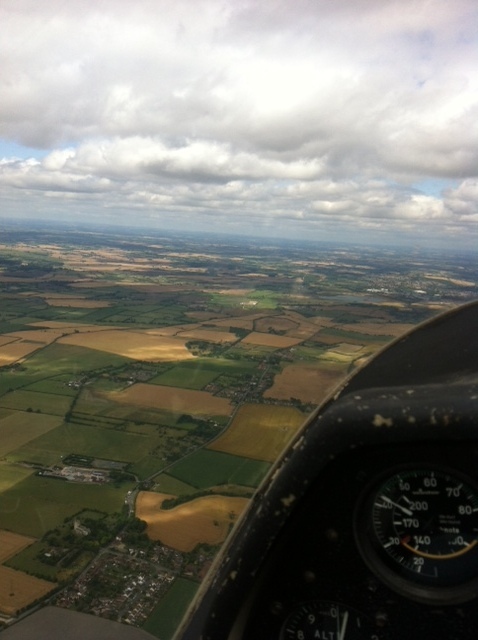 With no in-flight toilet to sprint to I sat quietly swallowing while my instructor banked the glider around and around making the most of a thermal he’d found and making me more and more dizzy and sick. I managed to take a photo of the view, a hard thing to do while holding open the neck of your jumper which is about to act as your very own sick bag let me tell you. 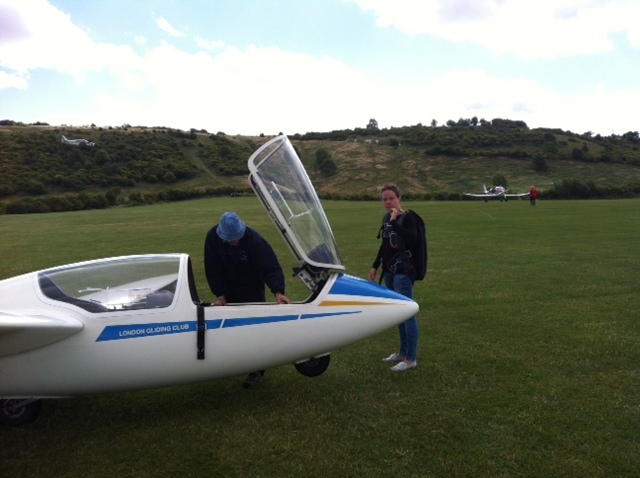 While I battled with a touch of post traumatic stress disorder and my boyfriend became an expert glider pilot (I’m not even joking) I sat in the car and read up on the history of gliding, which I found fascinating. For as long as humans have been human we’ve had a desire to be like birds and fly. The Greek myth of Icarus and Daedalus who fashioned wax and feather wings in an effort to escape their incarceration on the island of Crete is probably the most evocative and predictive story of the struggle to achieve human flight, and it took centuries before any truly meaningful efforts were made. It was a 9th Century Arabic inventor, mathmatician, engineer, poet, musician and all round curious genius Abban Ibn Firnass who was the first person to have his flight in a glider recorded. Despite his initial successes however he sustained some pretty serious injuries in a crash, putting a stop to any further flight attempts. The next person to make a recorded sustained flight in a makeshift glider was an English Monk Eilmer of Malmsbury, who is said to have flown a distance of over 200 meters by attaching big wings to his hands and feet and jumping off the roof of the abbey, however he too crash landed, breaking both his legs in the process rendering him lame for the rest of his life. 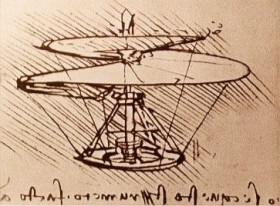 During the 15th Century Leonardo Di Vinci was famous for designing and inventing flying machines with a variety of different designs and constructs, including one (pictured) called the “aerial screw”. He never actually flew in one, although modern tests on some of his designs have proved they might well have worked. 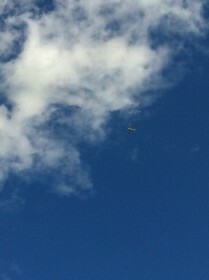 But it wasn’t until the mid 19th Century that marvelous men in their flying machines began to make any real progress. The Frenchman Jean-Marie Le Bris was the first man in 1856 to achieve flight at a height greater than his point of departure when his horse pulled him in his glider along a beach, allowing him to make a flight of 200 meters. Remarkably quickly after the Wright Brothers had made their first flight in 1903 flying went from being an impossible dream to a mainstream activity. 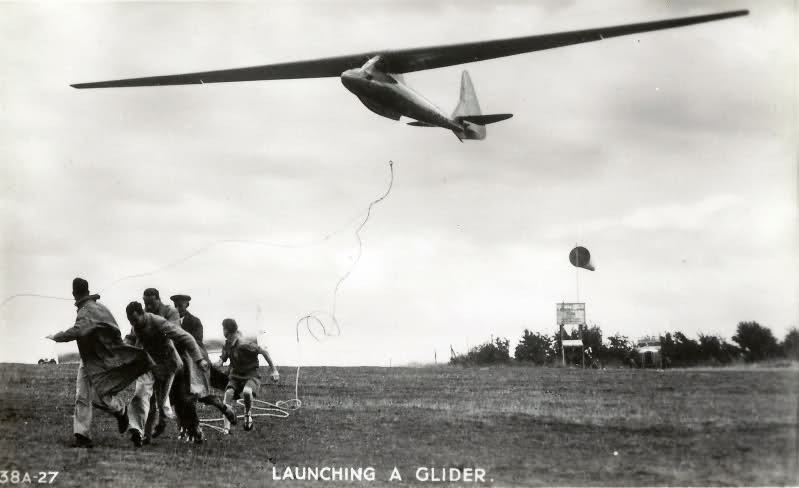 By the 1910s gliders were being manufactured in Germany and in the 1930s gliding had become a popular sport. The London Gliding Club is one of the oldest gliding clubs in the UK, established in 1930 when it was first based up the road on high ground at Ivinghoe. The spectacle of the people in their gliders attracted a lot of public attention, not all good as eventually they were evicted from the area because they “spoiled the peaceful enjoyment by the public”. 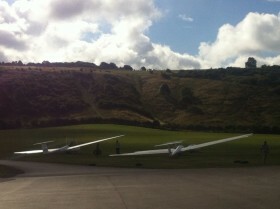 Undeterred the club relocated to just below the ridge at Dunstable Downs where the pilots could utilise much needed “ridge lift” to sustain their flights. Local boys were paid a bit of pocket money every weekend to run up and down the ridge pulling gliders and launching them off the hillside! Now gliders frequently make long distance cross country flights for hundreds of miles (records have been set of over 1000 miles!) across mountain ranges and seas. They are used extensively for recreation and military purposes and are even used as a cheaper alternative to fuel-thirsty planes for spreading fertaliser over huge swathes of crops in America. Even though I was rendered completely incapacitated by my time in a glider it was still an experience that made me marvel (like I always do) at the amazing feats of human endevour and made me appreciate just how we got to where we are in our modern world, dominated by our ability to travel far and wide, virtually anywhere anytime, but rarely giving the fundamentals behind it any thought at all. And that my friends is why I’m glad I had the experience of unpowered heavier than air flight in a craft that man has dreamt of achieving for as long as humans have walked on this here planet.